According to geologists, the eastern islands are significantly older than the Western Islands. Isabela and Fernandina, the youngest islands, date back to less than 1 million years ago. The Galapagos Islands are located at the Equator 1,000km or 600 nautical miles off the Ecuadorian coast in South America. They consist of 61 islands and islets, with 13 main islands. The total land area is 7,882 square kilometers within a marine reserve of 45,000 square kilometers. The 13 main islands are Baltra, Española, Fernandina, Floreana, Genovesa, Isabela, Marchena, Pinta, Pinzon, San Cristobal, Santa Cruz, Santa Fe, and Santiago. The Galapagos sprouted out of the Pacific from a sub oceanic lava vent on the ocean floor. The same process created the Hawaiian Islands, and nowadays this process continues in both island groups. Geologically these Islands are situated on one of the most active volcanic regions on earth: the Nazca Plate. Geographically, even though they are in the tropics, the islands are fortunate, since, they are not in the path of big storms or other natural phenomena. 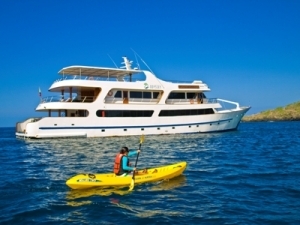 Traveling to the Galapagos Islands is a way to step back in time, visiting a quiet, untouched place on earth. This paradise is the ideal place for those who want to be in a pure and natural habitat, enjoying natural history and wildlife. The climate of the Galapagos Islands is subtropical; even though these islands are located around the Equator, the climate is far from being excessively hot. It is regulated by the cold “Humboldt” current and the warm “El Niño” current, creating microclimates on the islands influencing the particular flora and fauna habitats found on each island. The weather varies from season to season. June through December is known as the dry (garua) season. The strong Antarctic Humboldt Current, coming from the south, affects the climate at this time of year. When the winds blow in a northwestern direction, the islands are bathed in cool waters, cooling the air and creating unusually cold conditions for equatorial islands. From the end of December through May is considered the “hot” or “wet” season. The southeast trade winds diminish in strength and warmer water from “El Niño” current flow through the islands. During this season, the Galapagos’ climate is more tropical with daily rain and cloudier skies. Also, the ocean temperature is warmer for swimming and snorkeling. The Island’s flora lives in specific zones. Understanding these zones helps with identification and appreciation of the flora. From the Mangrove Swamps that cover the wet coastal zone, the Prickly Pear Cactus of the Arid Lowlands, the Scalesia Trees, to the Miconia of the higher Humid Zones. The Galapagos hosts an interesting array of flora.Climate on the islands varies from dry low areas along the coast, to the high moist areas near the volcano tops. There are 7 zones within the archipelago, and these are the: Coastal Zone, Arid Lowlands Zone, Transitional Zone Scalesia Zone, Brown Zone, Miconia Zone, and Pampa Zone. The Arid Zones is the most extensive vegetative zone. It is a semi-desert forest dominated by deciduous trees and shrubs. The plants have adaptations to withstand drought. There are great numbers of endemic species, like Lichens which are abundant in this zone because they are tolerant of dry conditions and are capable of absorbing moisture from the occasional garua mist.As an island slopes from the beach to an elevation of about 197 ft (60 m), an arid desert-like zone occurs. This region is home to the many Cacti that live in the Galapagos including the Prickly Pear Cactus, Lava Cactus, and Candelabra Cactus. Vine plants also make their home in the Arid Lowlands. The endemic lava morning glory and endemic passionflower can be found in this zone.At the top of the Arid Lowlands the silvery leafed Palo Santo Tree with its collection of lichens can be seen. It is intermediate in character between the scalesia and arid zones, but dominated by different species than either of the adjacent zones. The forest is still mainly deciduous, it is much more dense and diverse than forest of the arid zones, and it is often difficult to say whether any species is dominant.Higher up in the island, plants becomes more abundant. In the Transition Zone, plants from both the Arid Lowlands and the Upper Moist Zones grow. This zone is home to a variety of small trees and shrubs, including the endemic Pega Pega Tree and the endemic Guayabillo, which produces a small white flower that develops into a fruit similar to the Guava fruit.The Galapagos Tomato, endemic to the islands is a salt resistant tomato that has been used to create a hybrid, which is capable of growing in salty soil around the world. The transition zone merges into the evergreen Scalisia forest, which is a lush cloud forest, dominated by Scalesia Pedunculata trees. This type of forest occurs only on the higher islands and, being the richest zone in terms of soil fertility and productivity, it has been extensively cut down for agricultural and cattle ranching purposes. The Scalesia forest is diverse, and has many endemic species. Humid Epiphytes like orchids, mosses, ferns and lichens thrive in this zone’s constant moisture, as well as ornate trees and shrubs with color and charm. Scalesias and Pisonias are abundant at this degree of humidity. Not much is said about the highlands of Galapagos, but in reality this is an amazing cloud forest with unique features.The Scalesia Zone is the lowest of the “humid” zones. This zone is named for the daisy tree that grows between 970 and 1970 ft (300 – 600 m) in elevation. The Scalesia is one of the few trees in the Aster Family, and grows to16 – 50 ft (5-15 m) in height. Its trunk and branches are covered with moss and lichens. This area is humid, and gives the feeling of being in the rainforest.Scalesia Trees have been greatly reduced in numbers since humans arrived to the islands. Along with them came pigs and goats, which devoured the young plants and fed off of older plants. People also introduced the Guava plant, which is dense, and its growth patterns steal nutrients; it gradually makes it impossible for competing plants to survive. The Brown Zone is intermediate between the dense Scalesia forest and the Miconia shrub vegetation. It is an open forest dominated by Cat’s Claw, Tournefortia Pubescens, and Aunistus Ellipticus. Trees are heavily draped with epiphytes, mosses, liverworts and ferns, which give this zone a brown appearance during the dry season. This zone has disappeared due to human occupancy. The southern slopes of San Cristobal and Santa Cruz are the only places where there is a dense shrubby belt of Miconia Robinsoniana. Native trees are absent from this zone, and ferns are abundant. There are also more liverworts than anywhere else.Above the Scalesia Zone at 1,950 – 2,300 ft (600-700 m) is the humid zone named for the Miconia shrub that once dominated this region. The Miconia Robinsoniana grows at heights of 10-13 ft (3-4 m). It’s leaves are easily identified because of their yellow or reddish shading around the edges.The Miconia is endemic to the Galapagos, but since the arrival of man, it has become the most endangered plant in the islands. Introduced cattle have grazed the Miconia into dangerously low levels. Sea Lions live in large colonies. Adult males known as Bulls are the head of the colony. Bulls grow to be up to 7 ft (2 m) in length and 800 lbs (363 kg). As males grow larger they fight to win dominance, and for territory which includes a Harem of 5 to 25 Cows (females). Dominant Bulls will fight off any intruder entering the territory. Each female in the harem has a single pup born a year after conception. The pups have a strong bond with their mother. The mother will nurture a pup for up to 3 years. In that time period, the mother and the pup will recognize each other’s bark from the rest of the colony. The mothers will take the young pups with them into the water while the pups are in their nursing period. When the pup is 2 – 3 weeks old the mother will mate again. Within the colony, the pups live together in a rookery. Pups can be seen together napping, playing, and feeding. It is common to see one mother ‘baby-sitting’ a group of pups while the other mothers go off to feed. 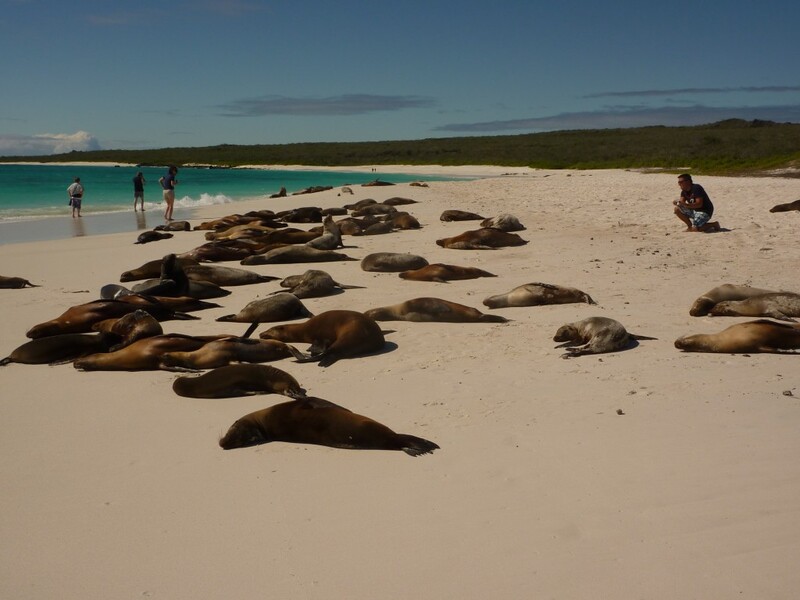 Galapagos Sea Lions are especially vulnerable to human activity. Their curious and social nature makes them more likely to approach areas inhabited by humans, which allows them to come in contact with human waste, fishing nets, and hooks. 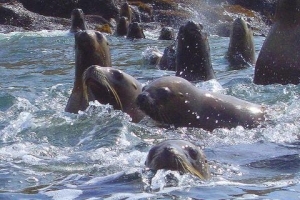 Sea Lions can be seen all over the islands. Snorkeling and kayaking with the playful pups is often the highlight of a visit to the Galapagos. 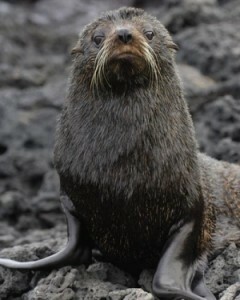 The Galapagos Fur Seal is the smallest of the Southern Fur Seals reaching a length of up to 5 feet in length at maturity. Their coats of dark gray brown to dusky black nearly lead these animals to extinction, as hunters targeted them. Pups are born with a smooth and silky skin to which fur develops around 6 months of age. This made them prime targets for hunters back in the 18th century. These animals have survived from the verge of extinction, and are the shiest creatures in the archipelago. Their numbers now compare in numbers with sea lions. During the day they hide from the hot equatorial sun in shelves or caves of the rocky lava cliffs of the western islands. At night they feed on squid and fish avoiding the sharks, which are their natural predator. 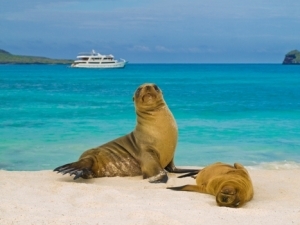 The Galapagos Islands are a World Heritage Site. One of the things that sets them apart is the uniqueness of the animals — especially the reptiles: ninety percent of the reptiles are endemic, and are found nowhere else on Earth.In 1845, Charles Darwin wrote that the Galapagos Islands seemed like “paradise” for reptiles; he was right. The Galapagos are dry and hot for the better part of the year, and there is not much to eat. Reptiles have adapted to these conditions. Their scaly skin is an effective protection against the sun, and they can find shade if they get too hot. They have a slow metabolism, being “cold-blooded,” and therefore do not need a lot of food. The Galapagos Islands also favor reptiles due to the lack of competition or predators in the form of native mammals. In the absence of mammals, Galapagos reptiles evolved to fill available niches. This is why most of the islands’ 22 reptile species are endemic. The land reptiles are divided into four main groups: tortoises, iguanas and lizards, geckos, and snakes. 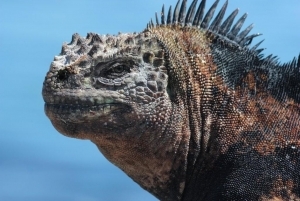 The marine reptiles are: marine iguanas and sea turtles.The Galapagos Islands are indeed known for their rich reptilian population, beginning with the giant tortoises, the “Galapagos” from which the archipelago derives its name. It was the giant tortoises, with 11 subspecies scattered about the archipelago that first called Darwin’s attention to the amazing diversity of the Galapagos wildlife. 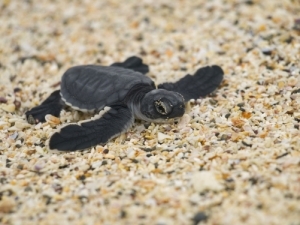 The most commonly seen sea turtle is the green sea turtle, which is considered to be endangered throughout its range, except in the Galapagos. A total of 140 species of birds have been registered in Galapagos: 58 residential, 76 migratory and 6 introduced. Close to 50% of the resident birds are endemic to the Galapagos. Some of these species are currently threatened due to factors associated with human presence. The majority of animals seen by visitors are birds. A haven for bird enthusiast, the Galapagos is home to a variety of sea, coastal, and land birds including three species of Boobies, Penguins, Finches, Flightless Cormorants, and Waved Albatross to name a few. The shear number and the seemingly tame nature of these birds are sure to amaze all who visit.Galapagos birdlife can be classified in 3 main categories: Sea birds, Coastal birds, and Land birds. The cool, oxygen-rich waters surrounding the Galapagos support an abundant marine flora and fauna which, in turns, support a variety of sea birds. The most obvious and frequently seen sea birds are members of the Pelecaniformes order. In the Galapagos, these include two species of frigate birds, three species of booby birds, the brown pelican, the red-billed tropicbird, and the flightless cormorant. No marine region would be complete without sea gulls (Charadriiformes order), and the Galapagos are no exception. However, there are only two species of gulls, the swallow-tail gull and the lava gull, and both are endemic to the archipelago. Another bird belonging to this order that is commonly seen is the brown noddy tern. 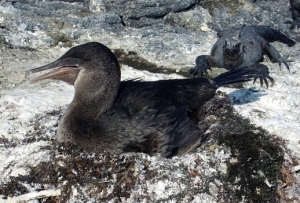 A third order of sea birds found in the Galapagos is the Procellariiformes. This order includes the ubiquitous, but difficult to observe, Audubon shearwater and a variety of storm petrels. It also includes the magnificent waved albatross, which, with its 7-8 foot wingspan is the largest bird in the Galapagos. The final major order of sea bird represented in the Galapagos, remarkably, is the Sphenisciphromes, the penguins! 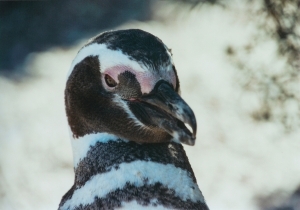 The sole penguin found on the equator is the endemic Galapagos penguin. Few species of land birds inhabit the Galapagos Islands, and 3 quarters of these are endemic, or occurring only in the archipelago. Unlike the seabirds, most of which are excellent long-distance fliers, land birds from the tropics have little cause to make long flights. Though relatives of all the Galapagos species may be found on the nearby mainland, only a freak of fate would bring them out a thousand kilometers from land. This must have happened, however, at least fourteen times in the past. With few exceptions, the land birds are singularly dull-colored. As if to make up for this lack of exciting color, their “tameness” is unsurpassed. With attitudes to man that seem to range from indifference, curiosity, and fearlessness, to outright impudence, the Galapagos land birds are a pleasure to watch and study.